This is all that remains of Haresceugh Castle. 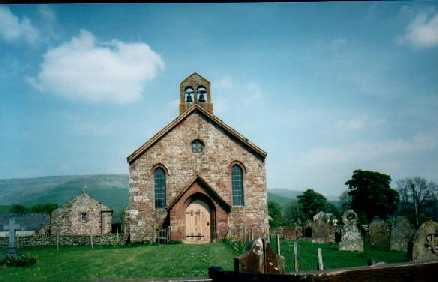 It was once a place of refuge for the people of Renwick, just as Scarrowmanwick served as a stronghold for the villagers of Croglin. 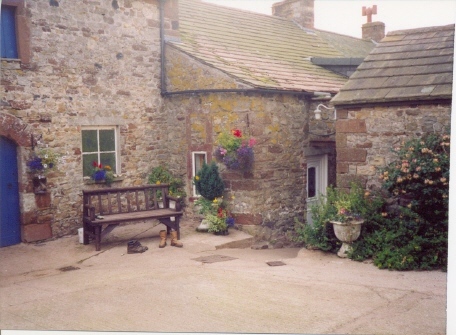 Stones from the old castle were used for the farm buildings in the adjacent farm house. This farm house was the home of the Blenkinships, or Blenkinsops as they sometimes called themselves. 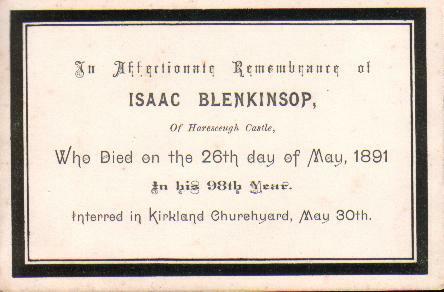 Isaac Blenkinsop was the first Blenkinsop to live in Haresceugh Castle. He was buried in Kirkland Churchyard, but according to the 1881 census he was born at Ousby. Further research has shown that he was christened there on 15th June, 1794 as Isaac Blenkins. His parents were Joseph Blenkins and Mary Cook. Joseph Blenkinship married Mary Cook on 9th May, 1773. 1.Ann Blenkinship christened 31st October, 1773 to Joseph Blenkinship of Skirwirth and Mary his wife. Ann married Robert Pearson 9th August, 1793, at Kirkland Church. Ann died 21st. December, 1860 in Stainton Dacre, Westmorland. Note: Ann and Robert have descendants living in New Zealand. 2. Mary Blonkinship christened 26 August 1777 at Kirkland Church. 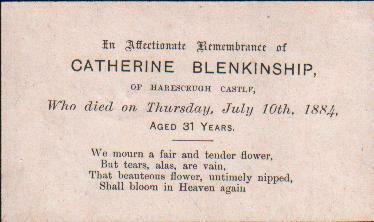 4.Sarah Blenkinsop christened 25th March 1780 at Castle Carrock, died 9th April 1864 at Liverpool aged 85. Married Henry Lennard 25th March 1813, Moresby, Cumberland. Note: Sarah and Henry have descendants living in New Zealand. Mary died 12 April 1818. Mary Blencaship c. 29 May, 1825. Morland, Westmorland. *Jane Blencaship c. 7 March, 1827 Morland, Westmorland. Ann Blencaship. c. 18 Feb., 1829. Morland. Thomas Blenkiship.c.21 April, 1831 Morland. John Blenkinship c. 13 Jan., 1836. Long Marton. 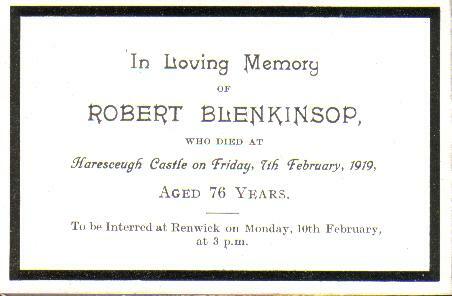 ***Robert Blenkinsop c. 30 May 1842 Long Marton. *Jane Blenkinship (4) married John Lowis 6 Nov., 1852 at Kirkoswald. Their daughter, Mary Ann, of Blunderfield, married Joseph Robley, of Scarrowmanwick, on 27th July, 1878. Mary Ann was my grandmother. Blenkmanship, Isaac farmer Greengill Bank, Morland. Blenkinship, Isaac farmer. Haresceugh Castle. Blenkinsop, Joseph & Robert. Haresceugh Castle. Kirkoswald. This is a good example of variant spellings of a surname within the same family. **Hannah may have been a granddaughter. Contributed by Marian Robley Foster, the great great granddaughter of Isaac Blenkinship (Blenkinsop).